I designed Mythica to be more practical for my climate. It doesn’t get too cold here often, but a little wool is still sometimes desirable. For the upper latitudes, Mythica would be a great transitional seasons top. Knit in three directions, Mythica has some complexity, but isn’t too difficult. Start with the cable band and work around the middle - grafting the ends together for easy knitting in the round. Pick up around the top edge of the band for the bodice and knit up. Then, pick up around the bottom edge of the band, and knit the skirt – which, of course, allows you to try on the top to determine the perfect length for your body! There is always something new to do, so it is hard to get bored while knitting Mythica! 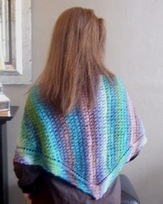 The bust is shaped with short rows for cup sizes C-DD. Finishing details, such as grafting the cable band in pattern, a sewn bind off for the hem, and applied I-cord around the neck and arms add a little polish. And the only seams are at the shoulders! Recommended for those with intermediate to advanced knitting skills. A beginner might find too many new skills to tackle with this top. Brittany is fabulous to work with and she will be more than happy to help you find just the right color for you!